Hardcastle Crags – our most successful Project to date! 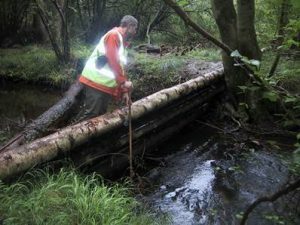 Leaky Woody Dams have been used successfully at Pickering and elsewhere to successfully attenuate the flow of water down the stream and river network. These dams were constructed by spanning logs above and across the stream bed and securing them in the banks with stakes or by using existing trees. To install successful LWD’s here in the Upper Calder catchment several technical challenges have to be overcome if they are to remain in place during a flood event. In the Calder catchment streams are fast flowing in flood events and stream flow forces are consequently greater than perhaps at Pickering, the first blog in this series introduced a method of constructing LWD’s on rock stream beds. This second blog considers how one might go about securing LWD’s on weak or soft soil banks. The Calder catchment sits almost entirely on what is commonly known as Millstone Grit, which is a type of sandstone deposited in ancient river deltas some 3.2 million years ago. Due to the deposition process certain reaches of our rivers flow through weaker sandstones which are susceptible to weathering which decomposes the sandstone rock to a soil, where present in river banks this soil is often water softened and has low in-situ strength. Our early work on the best places to install LWD’s concludes that the upper reaches of our river systems are most favourable for slowing the flow if we are to avoid delaying flows to the point where the flood peaks then later coincide with those from other tributaries in the valley bottoms. However, some of the banks adjacent to the stream beds in the higher reaches have a covering of soft soils sitting above the sandstone bedrock and simply knocking in timber stakes may not prove successful or indeed may not achieve the required capacity A conventional way of installing stakes deeper is to use piling plant and install driven piles in place of timber stakes, however, construction cannot be carried out practically using normal plant as even small mini piling rigs will struggle to reach many of the places we have in mind for locating LWD’s. In Scotland in 2012/13 a new overhead transmission line was constructed from Beauly near Inverness to Denny north of Glasgow, 600 pylon towers were erected many of them in inaccessible places on mountain tops and in remote valleys. A substantial portion of the final contract value was spent constructing temporary access roads for plant which at additional cost were later reinstated back to their natural state. We can avoid these pitfalls by engineering the LWD’s so that they can be constructed with handheld equipment that can be transported by quad bike and trailer and even wheelbarrow. A LWD is effectively a tier of logs (the sketch shows three, this could vary). 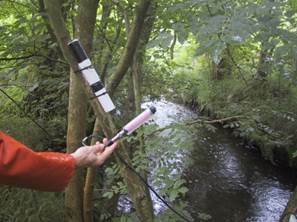 LWD is secured in position on soft soil stream banks by using driven tubes installed using a Grundomat. The tubes are sized and spaced to carry the bending and shear forces from the stream flow and the forces transferred into the soil in shear and tension are then reinforced accordingly with steel dowels. 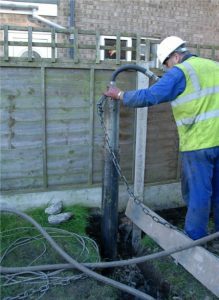 Cement grout is ideal for filling the tubes, made from Ordinary Portland Cement and water mixed at site in a barrel using a simple drill powered paddle mixer. 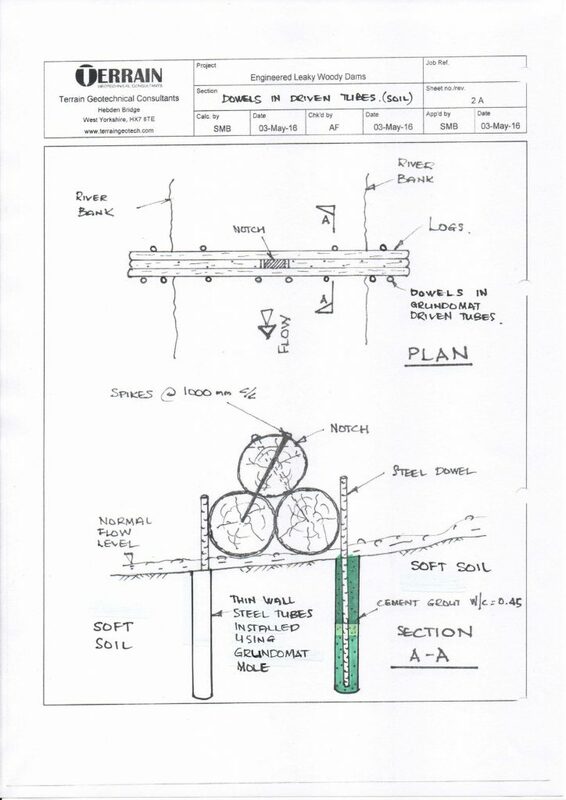 Where soft soil banks are present with a rock bed then a combination of Grundomat piles and cored in dowels from the previous blog is the way to go. 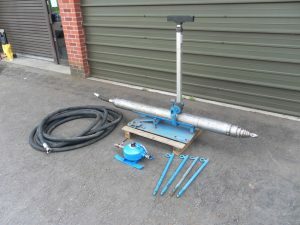 A Grundomat is a small pneumatic soil displacement hammer driven by compressed air, so the equipment requires a small compressor and a petrol driven generator. They are typically used for installing underground services without having to excavate trenches but can also be used for light piling. These dams are intended to allow the normal river flows to pass underneath along with any fish and attenuate water only in higher flows, with the intention that they also create slower over bank flow, so ideally they will be placed in areas where there are wide, low, flat river banks. Such interventions are cost effective and can play a significant role in managing downstream flood risk. Flooding – we can’t build ever-higher walls! Training, advice, guidance and support will be given to those joining for the first time! 2. Park in Hebden and walk to Hardcastle Crags. 3. Meet us at Hebden Bridge Station at 9.15 am or at car park opposite Hebden Bridge Town Hall at 9.20 on each volunteer day and we will provide a shuttle service. We will also return you back to Hebden at the end of the session around 12.30pm. Please wear appropriate clothing. NO SHORTS ARE TO BE WORN as we will be working in the forest undergrowth and this will leave legs exposed to the many bugs and ticks in the forest. Thank you for choosing to volunteer with us. If you have any special needs, please do get in touch and we will do our best to help you get the most out of volunteering with Slow The Flow Calderdale. © 2019 Slow The Flow Calderdale. Slow The Flow Calderdale is not responsible for the content of external sites.